Following the 2017 World Fish Carving Championships, a committee was established to evaluate all aspects of the WFCC and make recommendations to the show organizer and chairman Larry Blomquist. Entries numbers had dropped over the past few show where many of the categories (40 total) of the various levels had no entries or only one entry. Entries with no competition against them were winning ribbons by default. This committee was asked to submit a revised structure of the categories under the various divisions to better represent the changes the competition has seen over the past four WFCC shows. It was never the intentions of this competition to give ribbons in an uncontested way so it was time to reevaluate the entry process. The purpose of the WFCC competition is just that, to compete against other carvings and to determine which is the best. The chairman asked the committee to determine a way by which most, if not all, entries would have competition within each established division and/or category. The committee came up with a rule that will be recognized as the Three and Three Rule. This rule means that when possible there should be at least six entries (three entries that receive ribbons and at least three that remain) that fit the criteria and intent of that division or category in order to establish a competitive group. Example: if there are not enough entries (six) to fill one of the listed cat- egories, two or more of the categories may be combined, establishing a combined or general category in that division. The judges will make the final decision in combining categories as they will have the option of allowing five or even four entries to compete for ribbons if they feel they have very strong entries in all categories. It was recommended that the rules and regulations be condensed into a format that would be easy to read and understand. All the rules and regulations are basically the same as before, but in a more concise and orderly way. Note: A WFCC competition committee has been established to rule on anything not addressed in these rules and regulations. This committee will consist of Larry Blomquist, Ken Edwards, and the two fish carving judges selected for each show. The only exception to the Three and Three Rule will be if a level has fewer than six entries, then those entries will compete against each other. An example is, if there were only five total entries under Decorative Miniature Division, the Freshwater and Saltwater categories would be combined and compete against each other. OPEN: This level represents professional carvers, including those carvers whose work demonstrates the highest level of artistry and tech- nique. Best in World Titles can only be earned in the Open Level. Categories as determined by the Three and Three Rule and the top three entries as determined by the judges will be awarded first-, second-, and third-place ribbons. Best of Division winners are picked from first-place category winners. Once a Best of Division is selected, the second-place entry in that category will move up to compete for Second in Division against other category winners. Third in Division will be selected using the same procedure. It is possible for first-, second-, and third-place division winners to come from within one category. World Titles will be awarded at the discretion of the judges. If no carving is worthy, a World Title will not be given. DECORATIVE LIFESIZE DIVISION: Once a Best in World piece is se- lected, the second place carving in that category (if there is one), will move up to compete for second Best in World with the other Category First Place winners. Third in World will be selected using the same pro- cedure. It is possible for the first-, second-, and third-place Best in World to come from within one category. BEST IN WORLD DECORATIVE MINIATURE: The winner will be se- lected from the Best of Category winners in that division. As carvings are entered into the show, they are placed at the levels (Open, Intermediate, Novice, Youth) that are chosen by the competitors. When all entries have been received, they are then assessed and sep- arated into divisions and categories using the Three and Three Rule. For this to happen, there needs to be three carvings that fit a division with at least three carvings remaining. After divisions are established, they can be divided further into categories provided they meet the Three and Three Rule. The following definitions of judging criteria have been adopted by the World Fish Carving Championships. Each criterion is given equal weight in the judging process. These criteria will be used for all levels of competition. ACCURACY: Involves the correctness of a piece from a scientific per- spective. Is the fish the right size and proportion? Are the fins the right shape? Are colorations and patterns correct? Are the eyes properly placed? All of these are questions of accuracy. Anything accompanying the fish must be given the same scrutiny. Accuracy involves natural history of the whole piece, all of its components, and the appropriate- ness of these components together. ESSENCE OF SPECIES: Involves taking accuracy a step further. It is the ability to capture an attitude in wood, for example: Each species of fish has its own attitude. Some are aggressive while some are passive. This is why certain fish cannot be put together in aquariums. Another example would be how easily a wrasse is identified from other fish only by its swimming style. The essence of the fish is there without a scale or a fin ray count, a check on measurements, or being able to see any markings or color. You may have flawlessly created your fish with fault- less accuracy, but unless you have captured the essence of your subject and given it the spark that brings it to life, your fish will not achieve its fullest potential. ARTISTRY: Artistry of a piece involves its design and composition. This is where presentation, innovation, and creativity all come into play. There should be a beauty in the concept apart from the beauty of the fish itself. Line, form, content, color, mass, and movement should all be working together to create an integrated whole. Of all of the criteria in carving, artistry is the most elusive, the most difficult to explain, to teach, to analyze in the work of others, and to install in a carver’s own work. The difficulty, however, is an indication of the importance. All criteria are important. They all overlap and build on each other. In order for a piece to reach its fullest potential, it must succeed in all four areas simultaneously. For the sake of clarity we have dealt with them individually, but in reality the distinctions are not so clearly cut. As a competitor moves through the different levels of competition and eventually to the Open Level, technique/craftsmanship and accuracy as criteria are taken almost for granted, as these are tools expected to have been mastered, allowing the artist to concentrate on essence of species and artistry of the piece. The better a piece is, the more difficult it is to distinguish one criteria from another. This is how it should be. Ultimately, a piece should be a perfect union of all components in which the four criteria become one. ALL JUDGES DECISIONS ARE FINAL. 1. Eligibility: Any carving entered at a previous World Show is ineligible for this and any future World Shows. 2. Levels: A carver can only enter one level of the carving competition. A carver cannot enter two levels, such as both the Open and Intermediate Levels with different carvings. 3. Multiple Entries: Multiple entries are allowed in the various divisions and categories of the level a carver is entering. 4. Level Advancement: At the World Fish Carving Championships a carver can elect at anytime to move up in classification. Once a carver has voluntarily advanced to the Intermediate or Open Levels of competition, that carver cannot re-enter in the Novice or Intermediate carver at future competitions. 6. Nameplates: The name of artist should not be visible. The name will be taped over to prevent judges from seeing the name. 7. Glass Cases: Glass cases or domes must be removed for judging. 8. Subject: The wood sculpture must be of fish or fishes, though it may contain other animals or marine life as habitat. 1. The entry will consist of one or more fish of any species. 2. Entries are to be made of wood. Other materials may be used for habitat and structural purposes, however, they are to be hand-formed—with the exception of eyes. Eyes may be hand-made of manufactured. 3. Entries for Miniature Division must be one-half size or less and must not exceed 8 inches in every dimension (for the fish only). Both criteria must be met. 4. Large fish may compete in Decorative Lifesize Division as a reduced version provided the carved fish or fishes are at least 18 inches in length. There is no maximum size. For example a 12-foot, 600-pound marlin or a 6-foot, 80-pound chinook salmon would be carved so that the minimum size is at least 18 inches and reflects the mature anatomy of the lifesize fish. 5. Wall Mount Carvings: Any artist with an entry not suitable for tabletop display is required to notify Breakthrough Magazine (promoter of the WFCC) at least two weeks before the show for logistics and set-up reasons. 6. If a supporting pedestal under the base is needed, it must be provided by the artist and it will not be considered as part of the sculpture. 1. Entry is to be entirely of wood with the exception of the base. The base may be of other material and will be considered as part of the sculpture. No artificial eyes can be used in this division. 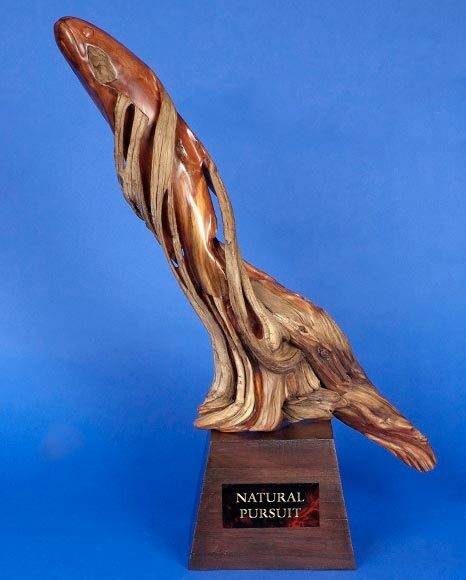 If a natural finish carving has glass eyes it can be entered in the Freestyle Division. 3. Stains and other finishes may be used as long as they do not completely cover or block the grain of the wood. 2. If a supporting pedestal under the base is needed, it must be provided by the artist and it will not be considered as part of the sculpture. It is our hope that this Free Style Division will release the creative efforts of fish carvers that may have felt restricted by other rules. Entries are to be made at least partially of wood but may be supple- mented by non-wood materials. Any materials are permitted and should be specified in the entry registration. All parts of the sculpture must be hand-formed and original. Castings and molds of existing fish or habitat items are not permitted. Opaquely painted fish without scales or fin rays, commonly known as “smoothies,” and any other fish carvings which cannot meet other division requirements, may compete in this division. If a base is used, it may be made of any material and construction, however, it will be included for judging. Any artist with an entry not suitable for table-top display is required to notify Breakthrough Magazine two weeks ahead of the show for logistics and set-up reasons. 1. This category is for lifesize fish or entries that fit the reduced scale criteria, which contain no carved or burned scale or fin ray details. 2. Details of the head may be highly detailed if desired. 3. Painting of the highest quality is encouraged. This category is for fish that are either free-form, three-dimensional art (from caricature, to chip carving, to northwest Indian, etc. 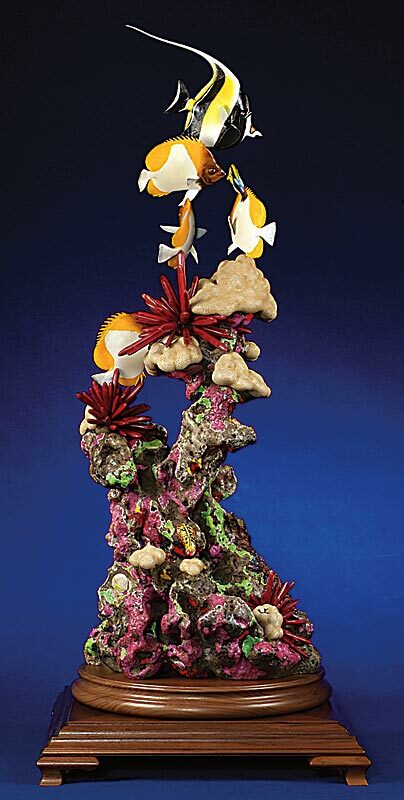 ), or functional art (fish head paper weights, lamps, bookends, etc.). 1. This division is for fish that are either rendered from commercial patterns, part of a class project, or the carver has received help from a mentor. 2. Entries are to be made at least partially of wood but may be supplemented by non-wood materials. Any materials are permitted and should be specified in the entry registration. All parts of the sculpture must be hand-formed and original. Castings and molds of existing fish or habitat items, such as insects or seashells, are not permitted. 3. Entries in this division may include entries which cannot meet other division requirements. This competition is to encourage youth to become engaged in the art form of fish carving, and to provide a venue to present their carvings to the public and give them competition experience. Entries may be done under the supervision of an adult, but the youth must do the carving and painting. Categories will be established if there are enough entries to do so. In addition, if there are three or more entries from competitors over 15 years old, and three or more carvings from competitors that are 14 years old and younger the youth division will be split into two age categories. YDC1 Age 15-17 and YDC2 ages 14 and under. • Entries must be made of wood. Glass or plastic eyes are permitted as are other materials for habitat and structural purposes. Hand- formed habitats are encouraged but not required for youth entries. (World Title Level) This level represents professional carvers, including those carvers whose work demonstrates the highest level of artistry and technique. Best in World Titles can only be earned in the Open Level. Separate Youth Level divisions will be established if there are enough entries to fill one or more of the categories with 3 or more entries, otherwise there will only be one division. YDC1 Age 15-17 and/or YDC2 ages 14 and under.